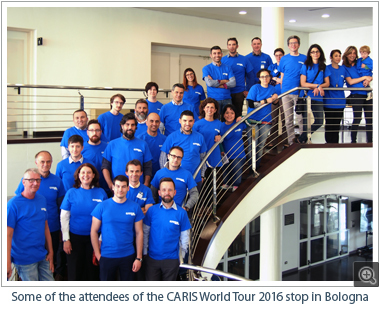 May 17–19 marked the first European stop of the CARIS World Tour in Bologna, Italy. It was hosted at the National Research Institute (CNR) conference centre, along with invaluable assistance from the Institute of Marine Sciences (CNR-ISMAR) in Bologna. The World Tour was well received with approximately 40 registrations for the entire event and a daily attendance of 30 participants. Attendees from various European countries and backgrounds including hydrographers and cartographers from Belgium, Denmark, France, Italy, and Netherlands, along with several Italian researchers from marine geology and geophysics. The 3-day workshop provided the opportunity for the marine community to learn about the next generation of CARIS™ software architecture, as well as other technology trends that are reshaping the hydrographic industry.